Buying an inflatable hot tub for your home is an exciting experience, but also challenging at the same time. The idea of being able to relax in your back garden in comfort and luxury, without having to spend a fortune on expensive equipment, is a pleasant one. However, with such a large amount of choice when it comes to makes and models available online, it can be confusing coming to a decision as to which is best suited to your needs. Well, that’s where we come in, with comprehensive reviews for all of the inflatable hot tubs on the market today, as well as detailed buying guides that contain everything you need to know about owning one of these fantastic products. What is a Blow Up Hot Tub? 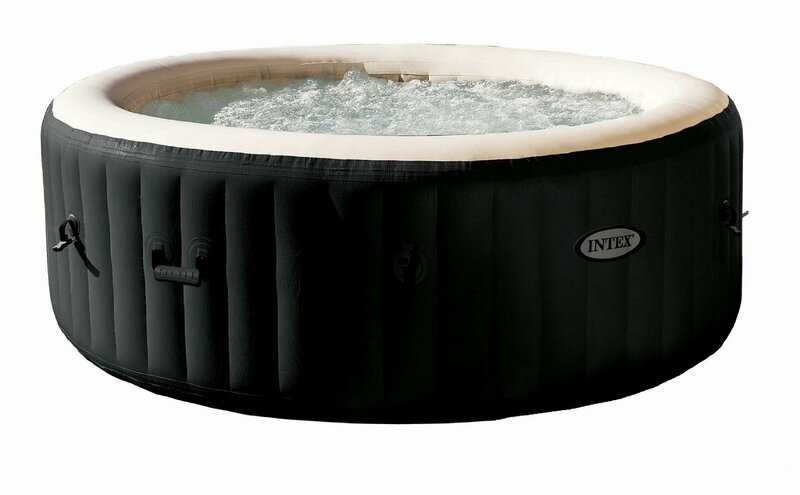 An Inflatable Hot Tub is a cheap and easy way to bring the pleasure of a health club jacuzzi or professional pampering day, to your very own home. A modern alternative to traditional permanent hot tubs, these products offer a plethora of advantages when it comes to practicality and affordability. There’s no reason to spend thousands of pounds building a permanent hot tub in your back yard any longer because for just a couple of hundred pounds, you can invest in an inflatable version instead. Just consider for a moment the money required to buy all of the building materials and then add on either the cost of labour to get it built, or the time it would take to do it yourself. It is also important to consider the cost of maintaining such a piece of kit, with replacements parts and expensive cleaning products quickly adding up. 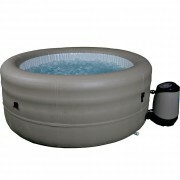 With an inflatable hot tub you won’t need to worry about having to connect it to the main plumbing in your home because all it needs is an electrical hook up, and you are good to go. In contrast, traditional permanent tubs require fixed plumbing, which means that you either have to fork out for an expensive tradesman to connect everything for you or try to tackle the job yourself, which is a challenging tasks for those without professional plumbing experience. Furthermore, inflatable hot tubs require no previous experience or skill to set them up and can be inflated and filled in roughly 20 minutes. 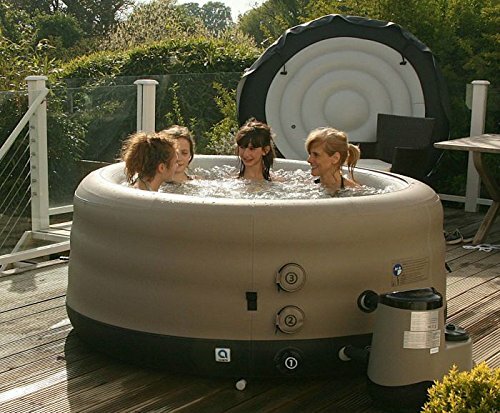 An inflatable jacuzzi is the perfect solution for those who don’t have the luxury of large gardens or outdoor areas, due to the fact that they can be deflated and stored when they are not in use. Just think of the amount of space a fixed tub would take up in your garden and consider whether you would prefer being able to use that space, should you feel like it. What could be better than being able to host a barbeque during the day, with ample seating for all of your guests, and then clearing the furniture away and inflating your hot tub, ready for those same guests to enjoy in the evening? 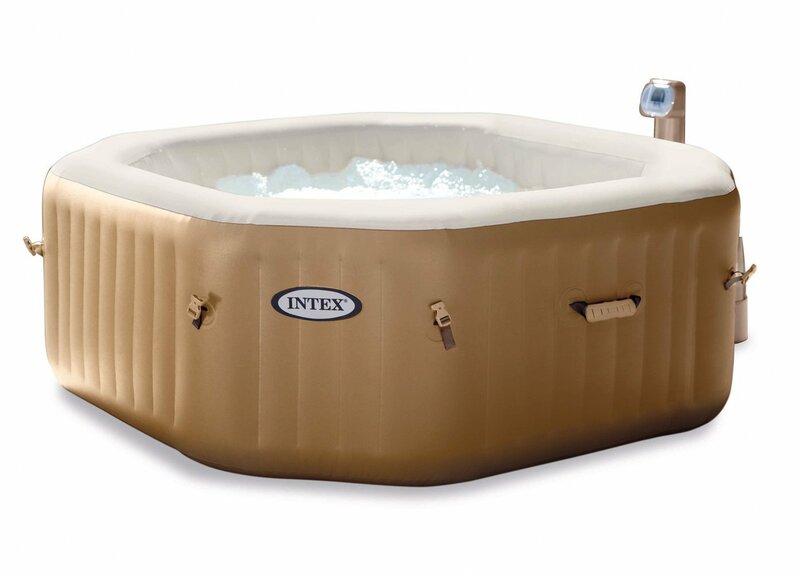 Another huge benefit on an inflatable tub is the fact that it is extremely portable, meaning that you can easily pack it up and transport it to a friend, neighbour or family member’s house to be enjoyed in a brand new setting, with a different group of people. Maybe you are heading to a holiday home by the sea and want to enjoy a relaxing soak, whilst admiring the beautiful view? Or maybe you just fancy moving your hot tub into that certain spot in your garden that gets the last of the day’s sun? Well, with an inflatable jacuzzi you can do just that, without any hard labour or lost time. An inflatable hot tub requires far less electricity to power it and can run off a standard 120volt electrical outlet in your home. This means that you will hardly notice any additional cost on your monthly bill, which is a common complaint for fixed tub owners, as well as those with swimming pools. This means that you can use your inflatable tub every single day if you feel like it, without having to worry about how much juice you are using. What are the Benefits of a Blow Up Jacuzzi? In today’s economic climate, many of us are forced to work long hours and deal with lots of stress at work and in our everyday lives. If we’re not careful, this strain can take its toll on our bodies both mentally and physically, leading to health problems further down the line. For centuries now, the benefits of therapeutic massages and hot water treatments have been widely acknowledged and people have been using such treatments to soothe aches and pains and release tension in the muscles. The next time you get back from work with a sore back or throbbing headache, just think about how nice it would be to have a hot tub out the back, ready to heal you from your taxing day. As well as offering health benefits, inflatable tubs are a great way to catch-up with your family or friends, in a deeply relaxing and enjoyable setting. It can be hard finding the time to converse with our loved ones because we all enjoy doing different things and at different times. However, if there’s one thing everyone absolutely loves doing, it is immersing themselves in beautifully warm water and letting the therapeutic bubbles do their work, so soon you’ll have the perfect place to have a chat. Are you dogged by bouts of insomnia or difficulty falling asleep because your mind is in a continuous loop of worry about work or fixation on personal problems? Lack of a good night’s sleep is connected to several medical conditions including heart disease and obesity. Studies show that we tend to fall into a restful night’s sleep more quickly and remain asleep with fewer bouts of wakefulness when we are warm and relaxed. This REM sleep improves, mood, mental alertness and even the way we metabolize food. Stress is at the root of many illnesses. Studies show you can lower mental and physical stress as well as anxiety by subjecting your body to a pulsating hot water massage combined with the feeling of weightlessness you experience in a hot tub. Subjects with type 2 diabetes in a study published in The New England Journal of Medicine reported spending ha half hour a day, six days a week in a hot tub and saw a significant drop in their blood glucose levels at the end of three weeks. By soaking in a hot tub after a strenuous workout, tennis game or long ride, you reduce the risk of injury, muscle soreness from lactic acid buildup, and stress on your joints, allowing for faster and better recovery. Because of the effects noted above, reducing stress and anxiety, promoting healthy sleep, reducing pain, high blood sugar high blood pressure, and increasing blood circulation, you are helping to combat the effects of premature aging on your skin. We all suffer minor aches and pains from time to time and they quickly disappear in a relaxing soak in a home spa. But many of us experience more serious ailments such as arthritis, carpal tunnel, joint injuries and tendonitis. A home spa can provide hydrotherapy to offer some relief. The buoyancy of the water and pressurized jets of hot water combine to relieve pressure on sore joints, increase blood circulation, relax muscles and help reduce inflammation. People with high blood pressure report lowering their numbers after developing a daily routine of hot tub soaks. Now that you’ve decided to invest in one of these fantastic products, it’s important not to rush out and buy the first one you see online because there are lots of things to consider first. After all, the last thing you want is to end up with a tub that is unsuitable for your needs and requirements. It is important to purchase a tub that has the capacity to hold all of your friends and family, without taking up too much space unecessarily. For instance, if you are planning on holding large parties, the last thing you want is to end up with a tub that only holds a couple of people. Similarly, if you only intend on enjoying the bubbles with your partner or solitary housemate, you probably won’t be needing a large tub that will only take up more space and consume more power. 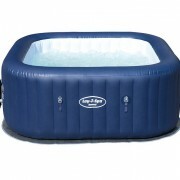 Fortunately, inflatable hot tubs are available in all sizes, ranging from those that will comfortably hold two adults, all the way up to six adults. 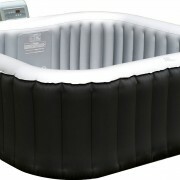 Furthermore, there are also inflatable jacuzzis available with raised seating, which is perfect for children. It is also important to remember that some tubs have thicker walls than others, which means that they will take up more space in your garden, whilst offering the same capacity as another tub that has thinner walls. 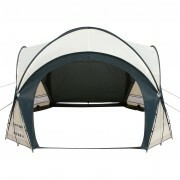 This is an important feature to check if you are particularly limited with garden space. 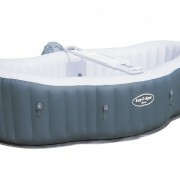 There are lots of safety features available with inflatable tubs that are there to ensure that you or your family don’t sustain any accidental injury. Firstly, many tubs come with anti-skid material on the floors and seats that ensure you don’t slip and bang your head when you are entering or exiting the tub. This is particularly important for those with young children, who tend to move at a hundred miles an hour, especially when the excitement levels are up and they are busy playing. 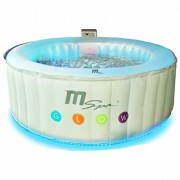 Most inflatable hot tubs have a maximum heat level that cannot be altered, which prevents scalding. When your hot tub is not in use, you can place a locking lid on top that ensures no one can gain access to the water, unless they have a key of their own. These are all important to look out for when you are buying an inflatable tub for your household. The number of water jets built into each tub varies, with some offering just one and others offering multiple jets. Usually, the cheaper the tub the less jets it has but for many folks who aren’t interested in wild water turbulence, one is enough. Some tubs also offer controllable speed settings, meaning you can vary the intensity depending upon your mood. 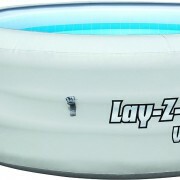 Inflatable jacuzzis are made from all kinds of material, with some offering increased strength and durability over others. Generally speaking, the more expensive tubs will likely put up with more wear and tear and last longer, compared to the cheaper varieties that are made from inferior material. Depending upon your personal preference, you may opt for a tub with a basic aesthetic design or something a little more extravagant with flashing lights and jazzy colours. All tastes are catered for when you shop online, with lots of choice when it comes to style and appearance.